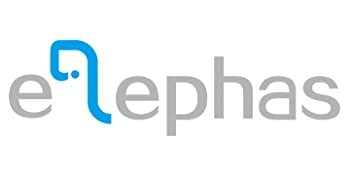 Sold by ELEPHAS DIRECT and Fulfilled by Amazon. 2018 UPGRADED TECHNOLOGY—ELEPHAS YG600 projector utilizes the upgraded LED light source and LCD display technology, which significantly reduces light attenuation. Comparing to other ordinary LED projector, it can provide you the high brightness and 3000:1 Contrast Ratio. BIG SCREEN EXPERIENCE —The Projection size is 44 - 200 inches with distance 4.9 - 18 feet, the best viewing distance is 10 feet with 98 inches. The Native Resolution is 1280*800 pixels and it supports 1080p. It is easy to set up and adjust the screen size. 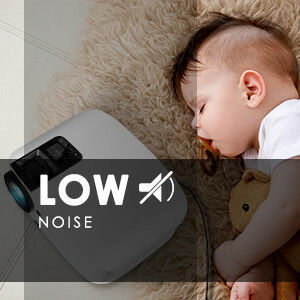 REDUCED NOISE AND LONG LAMP LIFE —With powerful cooling system design and innovative materials applied, ELEPHAS Home Video Projector makes the noise of the fan only half as loud as the other projectors. The LED lamp life is extended to 30,000 hours, which means you can use it more than 10 years. MULTIMEDIA CONNECTION —Interface includes HDMI/ USB/ VGA/ AV/ Micro SD Card/ Audio Out 3.5mm. ELEPHAS projector can work well with Amazon Fire TV/ Roku Streaming Stick/ Laptop/ Blue-Ray DVD player/ PS3/ PS4/ Xbox/ TV box via HDMI input. 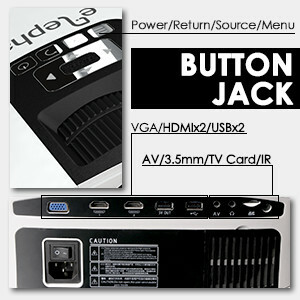 Connect to PC via VGA jack. Hook up to headphone/ outer speakers via Audio port. Insert U-disk/ hard disk device into USB slot. Insert micro SD-card/ TF card into SD port (Not work with SD card). Adapters are required to connect to an iPad, iPhone. 100% WARRANTY GUARANTEE —ELEPHAS company provides with 12 months warranty and lifetime professional customer service & technical support. If you have any questions or concerns, please feel free to contact us (E-mail: support@elephas.com.hk). we will always be here to serve for you and provide you customer service as well as a great-quality product. Sold by ELEPHAS DIRECT and ships from Amazon Fulfillment. Sold by UTSAU and ships from Amazon Fulfillment. Equipped with upgraded LED source. Therefore, it can provide you the high brightness and lumen. 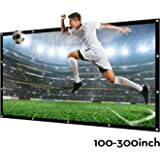 With image size up to 200-inch, it gives you an amazing experience just like you’ve brought the theater home. 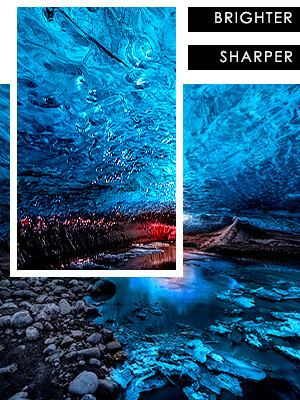 The 3000:1 dynamic contrast ratio and proprietary display technology will provide you with a wide color range and stunningly beautiful images as well. The pure LED lamp displays natural and rich colors bring you the vivid and real visual experience. Digital HDMI connectivity that support to connect the DVD player or gaming console via HDMI cable, to enjoy the leisure time with your friends or family. 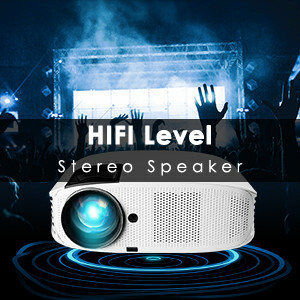 Built-in the speaker with HiFi quality, but for even better sound, we suggest you to add the own speaker. Built-in dual stereo speakers (3W) with SRS Sound. With double clear sound quality, whether using it indoor or outdoor, the powerful speaker gives you a different and amazing experience. 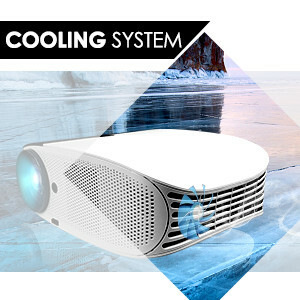 ELEPHAS YG600 projector adopts upgraded cooling system, which brings double heat dissipation. With the improvement of cooling system design and innovative materials applied, there's no need to worry about the heating. With cooling system upgraded and retrofitted, fan noises are greatly reduced. You won't be bothered by the noises caused by the projector anymore. YG600 projector provides you with a real quiet atmosphere to enjoy your leisure time at home. 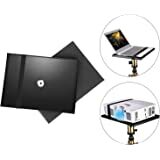 It meets your different needs by providing you with multimedia slots-AV / VGA / USB / Micro SD / HDMI / Audio to connect a variety of devices. Dual HDMI & USB ports design makes it more convenient to use. While watching movies or viewing pictures, you just need to plug your device into the USB port. You can also connect your iPhone, iPad or other devices with HDMI adapters. 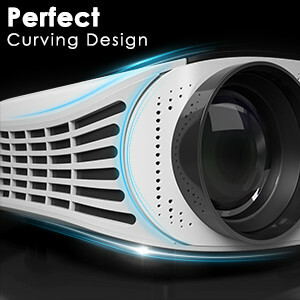 The upgraded projector completely meets customers' demands who are in pursuit of a perfect curving design, and the curves over the sides are engineered to make it easily in carrying. Meanwhile, it has the sleek texture because we adopted the stunning ABS material which is durable, firm and heat-resistant. ELEPHAS company has been founded for more than 10 years, and our experienced technical team keeps in researching and developing the latest projection technology. 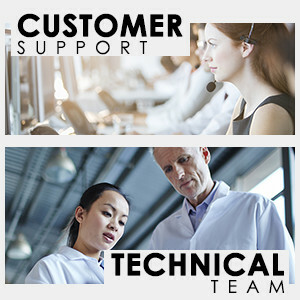 Besides, our professional customer service team will offer timely help to you. If you have any questions or concerns about our products, please feel free to contact us at any time. We will try our best to help you. 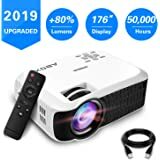 5.0 out of 5 stars2018 Budget projector of the year, Simply outstanding. 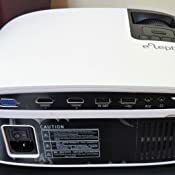 After reviewing several different projectors of different brands and price points, I decided to go buy this one the Elephas YG600 1080P LCD Video Projector 3600 Lumens and this is my review. 1. MONEY VALUE - I am always looking to get the biggest bang for the buck regardless of what type of product I am buying. I am willing to pay more money for a more superior product if it means the product will last longer and the quality is better. 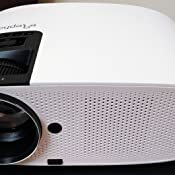 However, this projector defied all the odds by being one of the best fully featured projectors at this price point and as it turned out awesome quality. 2. 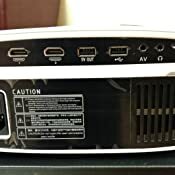 INPUTS/OUTPUT OPTIONS - I wanted a projector that allowed multiple types of inputs and outputs (HDMI, USB,SDHC and Audio) which this projector had. Although the audio on the projector is enough for most settings, I wanted a deeper bass and crisper sound for music so the audio output allows me to use an independent speaker. I’ve connected my google Chromecast and Roku TV box to make it a complete multimedia centre. 3. LUMENS - The majority of projectors at this price point were only 2400 lumens (give or take). 3600 lumens may not sound like a lot, but when you are projecting onto a wall in your home rather than paying more money for a screen, the 3600 lumens allows the colour of the projected image to overpower the colour of the wall (being that the wall colour is pretty light). 4. HDMI CORD - I initially forgot about buying an HDMI cord. However, when I opened this projector they already had one in the box which works great. Couldn't believe it was already there for me and they went above and beyond to lower their profit margin by a little bit to have a better customer experience. 5. 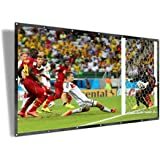 VIDEO QUALITY – Outstanding video quality absolutely mind blowing for the low cost, super sharp across the full 100” screen. I have my PC and console connected and experience little to no input lag so perfect for gaming. OVERALL - I would and have HIGHLY reccomended this projector to anyone who asks or sees the setup we have at our house. Due to purchasing it in the winter time I have not tried it outside yet, but as soon as the cold breaks our family will be taking it outside for family BBQ’s and just fun in the backyard. 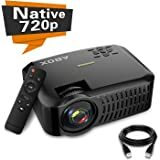 This is actually the best 720p Projector I’ve seen so far this year that I purchased from Amazon AU. However it did cost me $100 more, over the others. 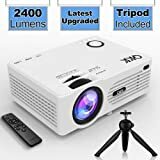 I would have actually given this product 5 stars, however I’ve experience the same issue others have had with this projector (slight disappointment). The issue with the Center of the image, it is sharp but then you find the edges were blurry. I’ve played around with the focus/keystone knobs, it didn’t really seem to help fix the problem. I’ve tried the AUN C80 (worst) and the Abox A2 (pretty good) previously and my conclusion is that this is by far (not perfect) but as close to the best you can get I think given the price you’re paying. It’s costing you more $$ to get this compared with the competition but I can see the quality is there with this product. The Packaging looks excellent. Remote control works great. All that was missing was the free carry bag *8-). It would have been nice to have one Included. I’ve attached some video just to show the image quality, mind you this was recorded during the day with some light coming through the bedroom window blinds (closed). But it still looked great. I have no doubt that at night it would look even better. The brightness is excellent and the colours looked good. Thanks to it’s 3000:1 contrast ratio, I think it made a big difference in making the picture sharper. You can even read online webpages with this easily. Text displayed is quite good in the center of the screen, again blurry though around the edges. The sound coming out this thing is good! This was no surprise as I was expecting it since I’ve watched other reviews mention this online as well. Overall it’s a really good quality product, you are getting what you pay for. 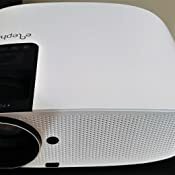 If you can afford to spend a little bit more $$ on a budget projector, I’d recommend this one. 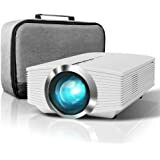 I had bought an UNIC Portable projector whihc i returned it with in a day as it failed miserably in its picture quality and user convenience. Then i cam across this projector with $260 price tag and i thought i should give it a try - Well I will never regret this choice. 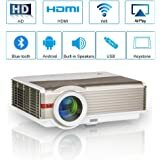 This projector is being installed in my bedroom on to the side of the couch and the image is being projected on the white wall 85 inc screen. The picture quality is not the best in market but for 260$ budget - this Full HD picture is amazing. Its bright and crisp image makes movie watching experience at its best. The quality is at its best when in dark and good image when in light. The most silent projector i have seen. Well it took exactly 3 minutes for me to open the box and put out a test image on the wall through my laptop. YES its that User friendly. Right now i am projecting using Google chromecast for all my movies from my phone and i have a bluetooth transmitter fitted as well, so i can get the sound on my wireless headset - so i can easily watch my movies in bigscreen at night without disturbing my wife who sleeps besides. 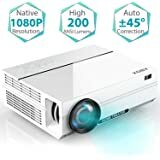 Overall extremely happy with this projector, i would recommend this to anyone who has under 300 budget and who is planning to use this for gaming or for kids or for movies within budget. Happy to Answer any questions in regards to this product.